Do Kinesiology Tape Benefits Stick? Remember the summer Olympics when beach volleyball players sported black, pink or blue tape strips on their shoulders and legs? Kinesiology is the science behind muscular and skeletal movement. Kinesiology tape is designed to support muscles and joints without impeding movement. Kinesiology tape mimics the body’s own skin, light, thin and flexible. It is latex-free and can withstand the harsh conditions of sweat, dirt, and water for up to 3-5 days. The tape is applied directly over or around the borders of muscles and joints to provide support to an injured area. Its unrestrictive motion properties allow many athletes to still train with an injury. Enthusiasts believe that kinesiology tape also speeds healing by slightly lifting the skin away from sore or injured tissues to improve blood flow and lymphatic drainage. 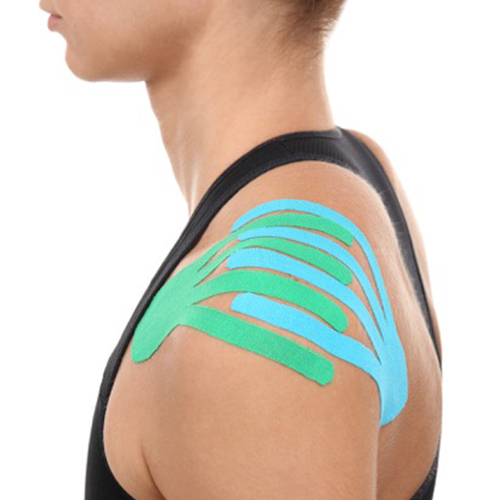 Kinesiology tape can be applied in hundreds of ways. Custom shapes, as well as the direction and amount of stretch placed on the tape, is determined by an orthopedic assessment. It is safe for populations ranging from pediatric to geriatric and is used for a variety of orthopedic conditions. Research studies on kinesiology tape benefits are ongoing. Jim Thornton, president of the National Athletic Trainers’ Association, explains: “It is possible that it has health benefits like improving muscle flexibility and reducing pain, but we just don’t know yet.” However, many high-level athletes use and endorse kinesiology tape and stick to their belief that it helps prevent and heal injuries as well as allows for full range of motion when training and competing. Healthy skeletal muscles are essential for peak performance. The orthopedic specialists at DOC, after a thorough examination and necessary motion and imaging tests, will diagnose and provide the best treatment options for all musculoskeletal conditions.